One of the most popular cars sold in India, all fall in the micro car segment. Small little hatch backs that are affordable, reliable and easy to drive. The segment includes cars like the Hyundai Eon, the Renault Kwid and the most loved car of them all, the Maruti Suzuki Alto 800. Now there is a new kid on the block, and that kid is from Renault's sister company, Datsun. Datsun has finally revealed the redi-GO hatchback which is to go on sale next month in India. We see how the redi-GO fares with its existing rivals. First of all the redi-GO shares all of its internal bits with its sister car the Kwid from Renault. so naturally, both cars have the same power trains and drive trains. All the cars in the segment get no more than 3-cylinders petrol engines. The Kwid and the redi-GO have a 799cc engine where as the Alto has a 796cc engine. The Hyundai however gets a power plant with a 814cc but only 9 valves compared to the other three which have 12. All three cars get 5 speed manual gearboxes and all of them are front wheel drive. the Hyundai is the most powerful with 55hp, the Kwid and the redi-GO have 53hp and the Alto is the least powerful with only 47 horses in its army. Its pretty much he same story with the torque. Out of the three engines in comparison, the Kwid and the redi-GO have the most efficient power plants which give 25.17km/l*. In comparison, the Alto 800 with its smallest engine sips fuel at a rate of 22.74km/l* and the Hyundai which gives 21.1km/l*. All of them being front wheel drive have Mcpherson Strut setups at the front. the Renault and the Datsun get Twist beams at the back, a torsion bean for the Hyundai and a 3-link rigid suspension setup at the rear for the Alto 800. They all have disc bakes at the front and drums at the back. the Hyundai, the Datsun and the Renault ride on 13 inch wheels while the Maruti has smaller 12 inch wheels. All four cars come with power steering, power windows at the front and can squeeze in 5 humans. but the redi-GO is the only one which get Daytime Running LED lights, the Kwid is the only one that gets a touchscreen infotainment system with navigation, and the Alto is the only one that isn't offered with even a driver airbag as standard. However, Maruti will fit an Airbag as an option in the Alto 800 if the customer desires for an additional fee across the range. The redi-GO, Kwid and the Eon all come with a driver airbag only in the top trim. Now that the redi-Go has been launched, the announcement has shaken things up quite a bit. Earlier the crown that was held by the Alto, of being the cheapest in the segment, has been removed. Datsun have launched the redi-GO for Rs. 2.38 lakh, while the top variant of the redi-GO matches of that of the Alto at Rs. 3.34 lakh. This makes the redi-GO a very good value for money car and a contender for rivalling Maruti. The Renault Kwid is slightly more expensive than the redi-GO starting at Rs. 2.62 lakh. But the Hyundai is the most expensive car of the lot with starting price of Rs. 3.24 lakh. But the Eon has a slightly bigger engine. In this segment, the competition is fierce. All the cars are very evenly matched and offer almost the same amount of kit. It all boils down to the price for these cars. the competitively pricing of the rediGO makes it a perfect rival for the Alto 800. But the Kwid and the redi-GO are quite evenly matched despite the Renault being slightly more expensive. 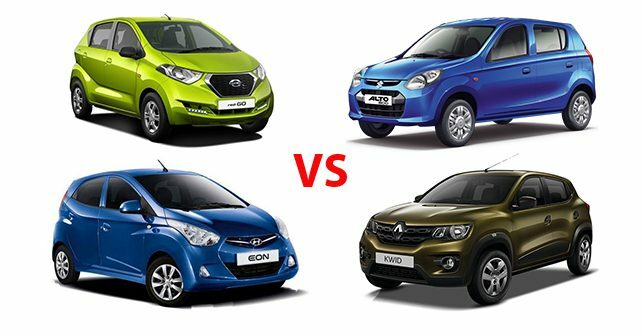 The redi-GO and the Kwid offer more value for money and are more spacious than the Alto 800 which makes them generally a better option. The Hyundai Eon is priced higher than all the cars as it not only offer slightly better build quality, it also has a slightly bigger engine and more equipment when compared to the competition. Both Maruti and Hyundai offer the Eon and the Alto with 1.0L engines, Renault will also launch a 1.0L option in the Kwid later in the year. The same engine will also make it to the RediGO later on in its life cycle.